The new exclusive OEM Group Workmate Hottie. Powered by a Genuine Spitwater SW15200DE set on a Galvanized 8 x 5 heavy duty trailer. 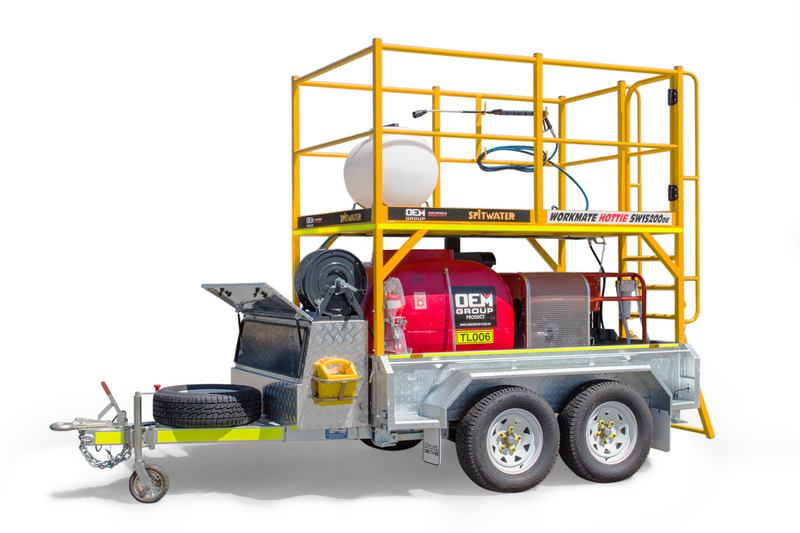 With off road wheels rated for 2.8 ton, and a top platform measuring 1.5 metres wide and set at 2.55 metres high this trailer is made for heavy duty work in tough Australian conditions. The platform comes with 1.2 metre high handrails and self closing barn style doors. Built for safety as well as portability and productivity, included is a folding rear ladder with handrails and yellow anti slip on the ladder rungs. Included is also a lockable aluminium toolbox, muffler guards, wheel chocks, fire extinguisher, electric brakes, a spare tyre, chem jet chemical, a low level cut off and a pintle ring hitch.